NETWORK UPDATE: ABC’s COLLEGE FOOTBALL adjusted up 0.1 in final numbers to 1.1, and FOX’s game remained at 0.8. 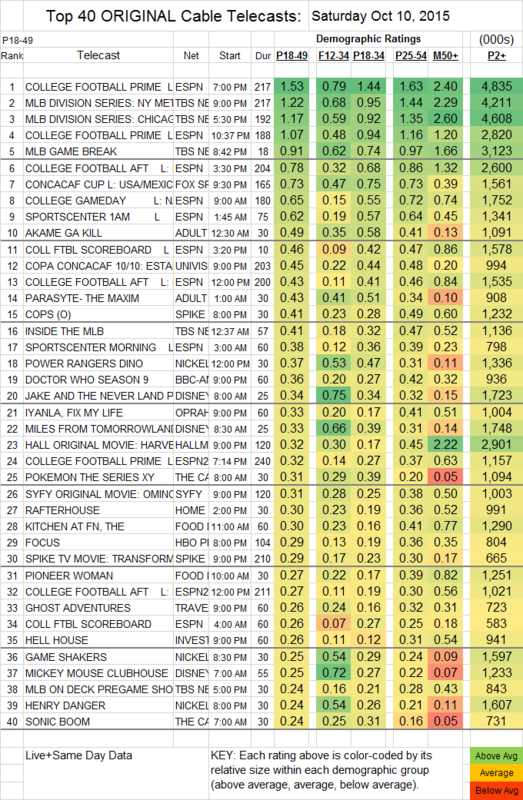 On the rerun front, CBS’s were respectively up and down 0.1, and THE VOICE on NBC lost 0.1. CABLE HIGHLIGHTS: As always with fall Saturdays, cable was dominated by sports. ESPN’s primetime COLLEGE FOOTBALL led the way at 1.53 (with the late game at 1.07 and an afternoon game at 0.78), and TBS’s pair of MLB PLAYOFFS were at 1.22 (Mets/Dodgers) and 1.17 (Cubs/Cardinals). Soccer scored 0.73 with the CONCACAF CUP on Fox Sports 1, plus 0.45 on Univision. Adult Swim broke into the sports crush with DRAGON BALL Z, up 0.04 to 0.62 in the demo with 1.29M total viewers. The rest of the Adult Swim anime line-up had AKAME GA KILL up 0.03 to 0.49, PARASYTE up a tick to 0.43, MICHIKO & HATCHINI up 0.05 to 0.41 (848K total viewers), NARUTO up 0.09 to 0.40 (832K viewers), ONE PIECE up 0.06 to 0.36 (741K viewers), and KILL LA KILL up 0.04 to 0.33 (695K viewers). Spike’s COPS was up 0.09 to 0.41. On BBCAmerica, DOCTOR WHO gained 0.04 to 0.36, and the premiere of THE LAST KINGDOM was at 0.11. On the original movie front, Hallmark’s HARVEST MOON was 0.32, Syfy’s OMINOUS was 0.31, and Lifetime’s UNAUTHORIZED MELROSE PLACE STORY was 0.16, with the latter’s related lead-out specials at 0.16/0.13. On Starz, SURVIVOR’S REMORSE fell 0.07 to 0.12, and BLUNT TALK rose 0.01 to 0.07 (183K total viewers).